KATMAI (1972) The steel crab fishing vessel Katmai disappeared February 18, 1972 in the Gulf of Mexico. The newly constructed crabber departed Mobile, Alabama and was headed to Kodiak for the Alaska crab fishery. On board were owner Oskar Joos, his wife Carla Joos and eight year old child Cindy Joos and deckhand Clint Hollevoet. The Katmai was discovered in 8,920 feet of water 200 miles off shore in the Gulf of Mexico in 2012 and positively identified in 2013. KENNECOTT (1923) The 3620 ton steel motor ship Kennecott stranded and was lost at Hunters Point, Graham Island, BC at 11:55 p.m. Monday October 8, 1923. The vessel departed Cordova October 3, 1923 bound for Seattle with 31 crewmen aboard. Her cargo; 6000 tons of copper ore concentrates and 40,000 cases of salmon, was worth a million dollars. Captain John A (Laughing Jack) Johnson of Seattle claimed that “dirty weather prevented taking sight of sun to ascertain…position.” The USCG cutter Unalga, USCGS steamer Surveyer, and steamer Cordova all responded to the wreck site and took the crew aboard. It was determined that nothing more could be done. Soon after the British salvage steamer Algerine was dispatched from Victoria, BC to the wreck but ran ashore and returned to port in distress herself. Many of the Kennecott’s crew were taken to Ketchikan and then on to Seattle aboard the SS Alameda. 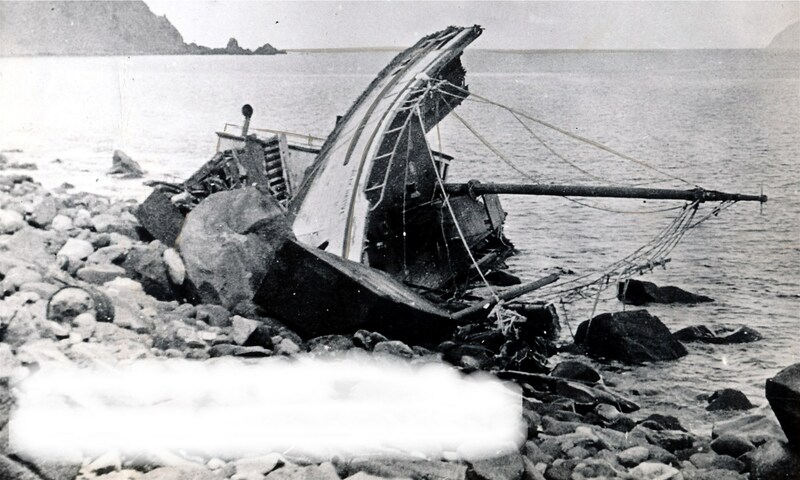 A group of 8 men including Captain Johnson were left on the beach to guard the wreck site. They were picked up by the salvage tug Hercules and transported home via Vancouver. Captain Johnson disappeared the night of October 21, 1923 on his way back to Victoria aboard the Algerine. The Kennecott was his second shipwreck as captain; the first being the sinking of the Ohio in 1909 in Finlayson Channel, BC. That wreck cost his purser, quartermaster, wireless operator and one soldier their lives. As the Algerine approached the earlier shipwreck site, it is said that “Laughing Jack” Johnson lept overboard to his death. The Kennecott is reported to have broken up quickly with two main parts of the hull drifting away and sinking. KENTUCKY (1926) The 39 ton 55 foot gas screw fishing vessel Kentucky burned and was lost at Halibut Cove September 23, 1926. KITTIWAKE (1913) The 23 ton 44 foot gas screw fishing vessel Kittiwake was lost off of East Cape, Siberia September 6, 1913. Hello, I had an uncle who worked for the Alaska Steamship Co. He was aboard the Kennekott when it floundered. He has many pictures of boats he worked on during that timeframe. I.E. S.S. Alaska Lakina, Cordova, Redondo Dupere, Dolphin, etc. You have a great site in reflecting of those long forgotten times of sailing.